Kelly Ishwari Waldek and I meet just over 5 years ago and immediately connected as people and artists. They have been a couple ever since and have had the good fortune to spend our time together in various studio spaces; initially in Bristol, exploring and refining our artistic pursuits – mainly printmaking, painting and filling sketchbooks. A few years ago they took up studio premises in Swindon and our attention became focused on nearby Avebury and the weird ancient monuments nearby. At Avebury and through friendships with fellow artists in Swindon they began to learn about the energies of the earth and how to meditate and connect with the land and the ancestors. Our art up until that point had been influenced mostly by our shared love of yoga, but after our encounters at Avebury another ‘intuitive’ dimension started to enter the work. The work on display will be by myself ‘Von Grey’ and my partner ‘Kelly Ishwari Waldek’. For 13 years Kelly was a successful children’s book and editorial illustrator, following gaining a 1st class Degree at Bath Academy. My background is in story-boarding and pre-production for film and animation. I began painting and exhibiting 8 years ago in an attempt to get back to creating art for myself instead of for clients. When I met Kelly her art career had sadly been halted due to the aggressive onset of Multiple Sclerosis, which had robbed her of her capacity to draw, or work. She was in a mode of survival, managing solely to concentrate on family and dealing with her condition. I was living in the thick of the Bristol art scene at the time and the infectious creative enthusiasm of the people they surrounded ourselves with reignited Kelly’s desire to create and a determination to find new methods despite her now altered capabilities. Her love for life in the art studio began anew along with her long since forgotten passion for linocut printing that she had learnt back in her teens at The Ridgeway School. She now enjoys star status on social media as @ishwariart as a master of her craft and sharer of printmaking techniques, and her devotional yoga practice has merged with her creativity to see her becoming a formidable and wholly unique ‘Mandala’ artist. I took a break from contemporary art to revive my passion for street art and went on to paint at Bristol’s Upfest and ‘See No Evil’ graffiti festivals. This led to the more psychedelic and abstract styles that come across in more recent works. 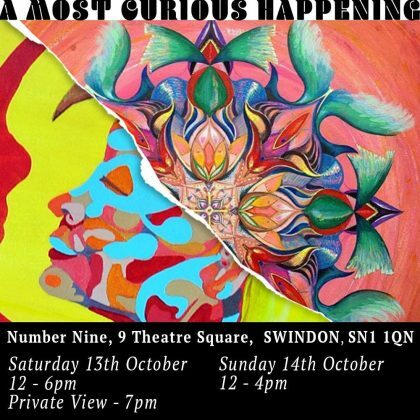 Kelly is now supported by Swindon’s ‘Artsite’ and has a studio at The Post Modern; the exhibition will take place in their Number NIne Gallery on Theatre square. The exhibition is called ‘A Most Curious Happening’, given that curiosity is the greatest shared motivator for all of our creative exploits. Every artwork is an intriguing revealing journey for us both. They feel it is now time to share our collection of completed works, developed in one another’s company over the past 5 years. The work is an exploration of our relationships with ourselves, each other, society, culture and nature. It’s the first time they have exhibited together and visitors can expect to see lino-cut prints, intuitive mandalas, miniature models, bold contemporary paintings and various ‘curios’. Details can be found by searching for #amostcurioushappening and following the amostcurioushappening page on instagram.